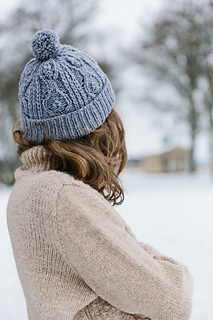 This cosy cable hat features a high brim and a pom pom made of leftover yarn from this enjoyable one-skein project. 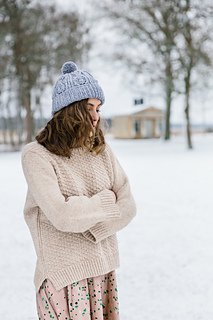 Luoto is one of those winter hats you need to knit several versions of, in all the different shades of life. Brim circumference: 21.25 inches / 54 cm. Height without pom pom: 11.5 inches / 29 cm. Yarn: 1 skein of Quarry by Brooklyn Tweed (100% Wyoming-grown Targhee-Columbia wool, 200 yds / 183 m – 100 g), colourway Geode. Needles: US 7 (4.5 mm) 16” (40 cm) circular needles or DPNs for ribbing and US 8 (5 mm) 16” (40 cm) circular needles or DPNs for the rest. 15.5 sts and 23 rows = 4 inches (10 cm) in cable pattern, after blocking.